Supplementary material for the MTH app. 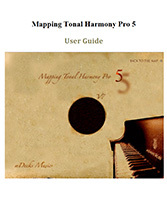 The volumes in the Mapping Tonal Harmony collection have been envisioned as auxiliary material in the study of Tonal Harmony. The main objective of these books is to provide the student, teachers, composers and/or songwriters with a tool that will aid them in hearing, analyzing, foreseeing, and composing harmonic progressions without struggle, in all keys alike. The basic major & minor diatonic neighborhoods. Tonic - Sub-Dominant - Dominant. • Perfect Authentic Cadence (PAC). • The use of V7 vs. V as a triad. 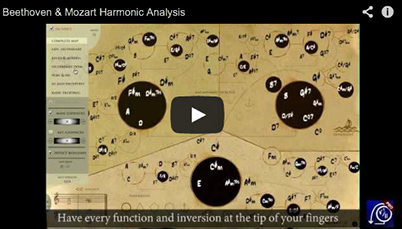 • Standard/Basic Harmonic Progressions in the nearby diatonic neighborhood. • Use of the Tonic- Sub-dominant - Dominant - Tonic progressions. Workbook 2: Mapping IIIm , I64, V7sus4 & Deceptive Cadences. Mapping IIIm , I64, V7sus4 and deceptive cadences. The complete diatonic neighborhood for Major-Minor. • The IIIm (ambiguous chord : Tonic vs. Dominant). • Cadential I64 or I/5, Im64 or Im/5 and V7sus4: all preceding the V7. • Borrowing chords from other modes. 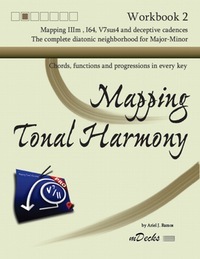 Workbook 3: More harmonic progressions and cadences in the diatonic neighborhood. Mapping the SubV7 and its use as a Neapolitan chord. Mapping the SubV7 and its use as a Neapolitan chord. • Inverted bass and bass lines. Pedal points: Tonic Pedal and Dominant Pedal. • Backward progressions and other progressions outside the circle of fifths. • The half cadence to V7 without secondary dominants. • The Neapolitan Sixth Chord (bII/3 or N6) and the SubV7 (bII7). Basic Secondary dominants and their related IIm7s. • Creating a temporary key center in the diatonic neighborhood. • Secondary Dominants (V7 and VIIo7 and the related IIm7). Mapping blues I7 IV7. Additional minor mode functions. The bIIMaj7 sub-dominant minor and its related IIm7-V7. • More borrowed chords from other modes and paths to modulations. • The IV7 from dorian minor. • The bIIMaj7 sub-dominant minor chord (or root-altered IIm7b5) and its related IIm7 and V7. The I7 as tonic in the Blues and Blues form. Advanced secondary functions and deceptive secondary cadences. Secondary cadential I64s & V7sus. Mapping IV/x , bVI/x, bVII7/x, viio7/x. • Creating a temporary Tonic in the diatonic neighborhood using secondary IV/x, bVI/x and bVII/x. • More borrowing from other modes and paths to modulations. • Secondary cadential 64s & V7sus. Workbook 7: The entire MAP, with all functions. The entire MAP, including all secondary functions. Mapping all secondary subVs/x and their related IIm. The N6 and Gr+6. • More Secondary functions: SubV7/X . • The Augmented 6th chords. Gr+6, It+6, Fr+6. • The related IIm7/X for the SubV7/X. • Extended dominants. 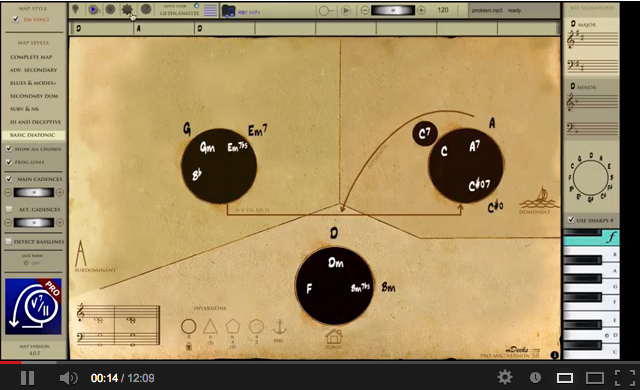 Reinterpreting chord functions. New paths to modulations.